Known as the mother river by the Chinese, the Yellow River is the second longest river in China (just after the Yangtze River)at the estimated length of 5,464 kilometers. It takes its source from the Bayan Har Mountains in Qinghai Province in western China, meandering across 9 provinces and finally emptying into the Bohai Sea. The Yellow River is called "the cradle of Chinese civilization", as its basin is the birthplace of ancient Chinese culture and was the most prosperous region in early Chinese history. For thousands of years, it has been admiring by literary giants, artists, as well as by the common people. It bears special significance: the symbol of the Chinese nation (for it looks like a huge dragon crouching on the central plains), the spirit of Chinese people (Yellow River plays a decisive role in shaping the character of Chinese people) and more importantly, civilization itself. 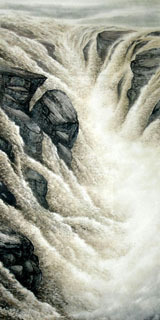 The natural landscapes of the Yellow River are breathtaking and attractive, especially the HuKou fall. 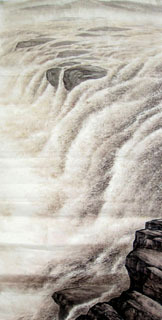 Yellow River water here rushes through the groove which is 50 meters wide only, and makes HuKou waterfall the most well-known attraction on the Yellow River. 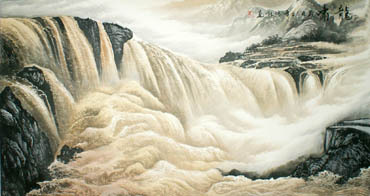 It also become the symbol of Yellow River. 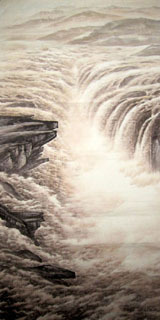 There is another famous legend stems from Yellow River--carp jumping over the Dragon Gate. 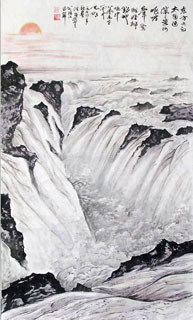 Dragon Gate is the narrowest part of the Shanxi-Shaanxi Gorge. According to legend, "when a carp jump over the gate, clouds will gather immediately, and it will begin to rain. Then, fire from heaven will burn its tail and turn it into a dragon." This legend conveys a wish that a person will change his or her social status and conditions through hard work. InkDance Price: USD 497 /GBP 408 /EUR 473 Sold, you can customize it. InkDance Price: USD 668 /GBP 548 /EUR 635 Sold, you can customize it. InkDance Price: USD 747 /GBP 613 /EUR 710 Sold, you can customize it.